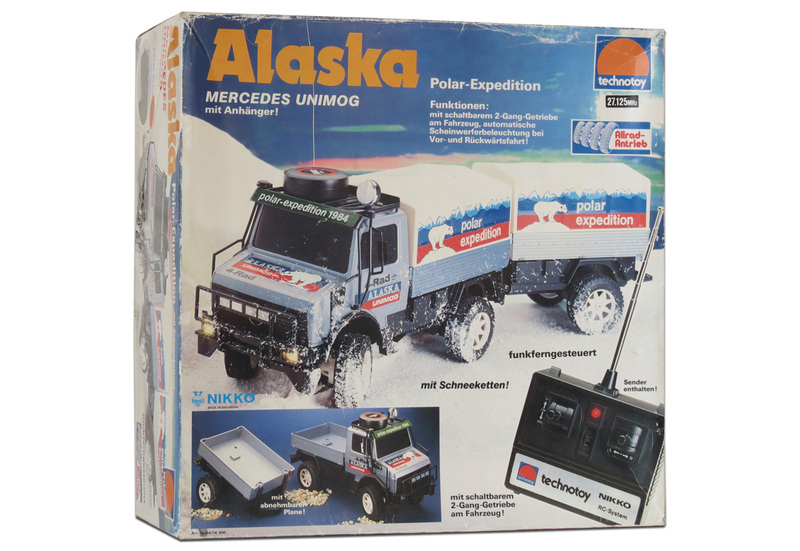 This model was based on Nikko’s 1983 Mercedes Unimog 4WD, but this edition was released later and only sold in Europe under Technotoy/Nikko branding. 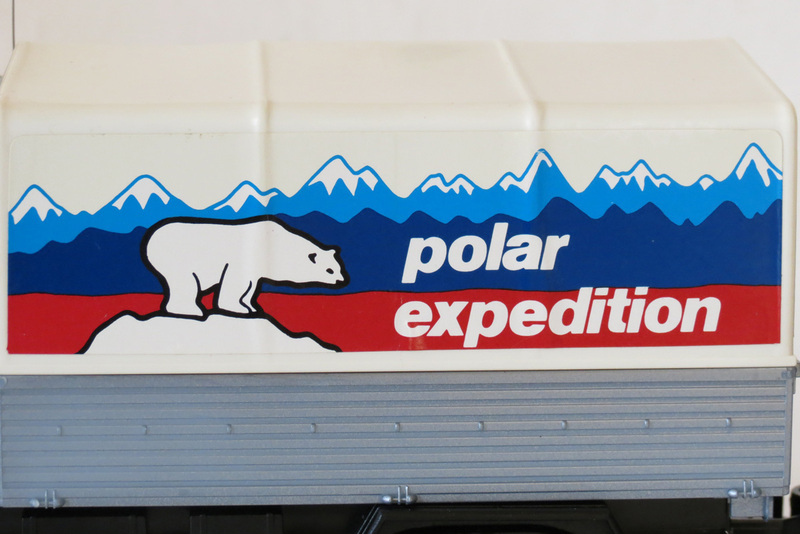 And instead of being a Paris-Dakar Rally racing vehicle, it’s a 1984 snow expedition transport – complete with gorgeous livery, a cargo trailer, and (would you believe) optional snow chains? Proof once again that no other era can touch the 1980s, for toys. 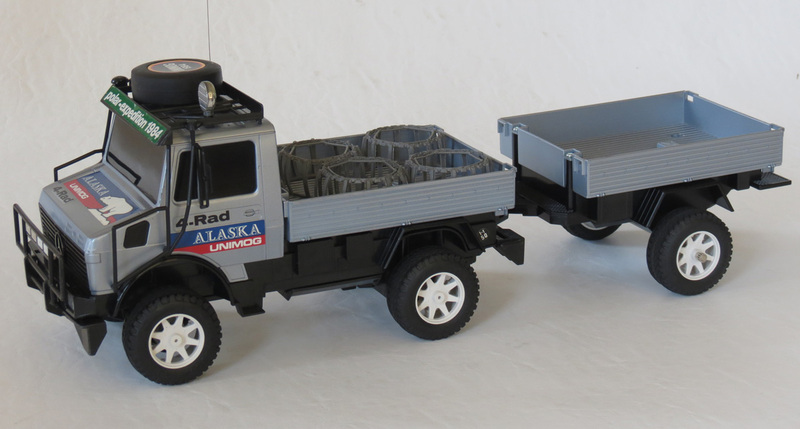 The original Nikko Mercedes 4WD Unimog is one of my all time favourite R/C models, thanks mainly to it’s realism and the fact it was modelled after a real vehicle that won the 1982 truck class of the Paris-Dakar Rally. I grew up being slightly obsessed with that toy, as Tandy/Radio Shack stores had also sold it under their own branding, and I nearly got one for Christmas in 1984. What I didn’t know at the time was that the R/C toys you grew up wanting were only those few you knew existed because they were being sold in your country. There was a whole world out there, and in other parts of it, there were many more amazing things you’d have wished you could get your hands on – if only you knew about them…(and if only you had money…and if only someone would invent the Internet). 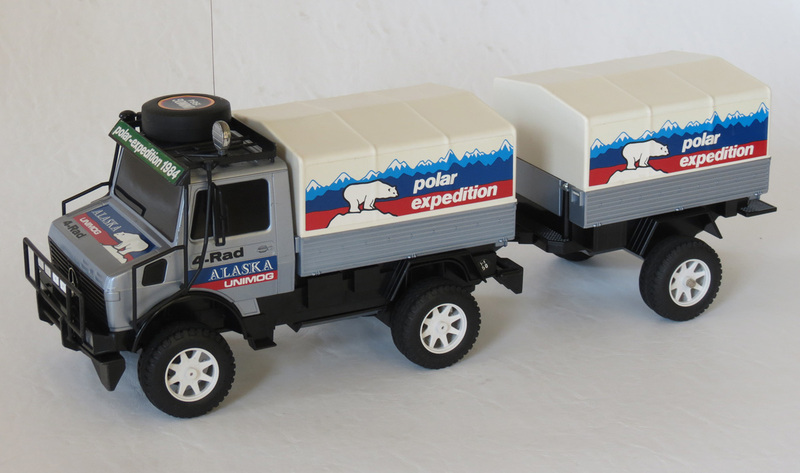 Such is the case with the Technotoy/Nikko Alaska Polar-Expedition Mercedes Unimog – a vehicle I’d have wanted just as much, if not more, than the Tandy version. Had I known it existed. 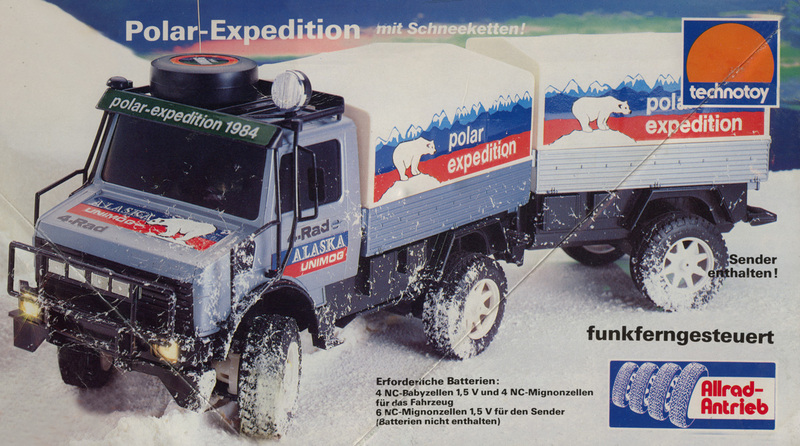 With a box depicting a snow-bound 4WD truck with working headlights, heading off on some remote polar adventure, this was a toy that effectively combined my obsession with off-road R/C toys at the time, with perhaps the second-most exciting thing my 8 year old mind knew about in the whole world: snow. I grew up in a region that received snow, but just the occasional winter fall – which always had the effect of making any “snow day” memorable and exciting. Schools would be closed, roads blocked, and a certain quiet would descend over the neighbourhood. Power and machinery would shut down, and soft snow would blanket the streets, houses and tall pines, rendering my familiar surroundings somehow more beautiful than before. On most snow days, my R/C toys would venture out as well, as the usual grassy trails of my backyard became a temporary Arctic tundra, complete with mountains (snow drifts against a fence) or the occasional treacherous ice-floe crossing (a puddle). This amazing 1/16 scale R/C toy set was the creation of Nikko in conjunction with the German toy distributor Technotoy GmbH. 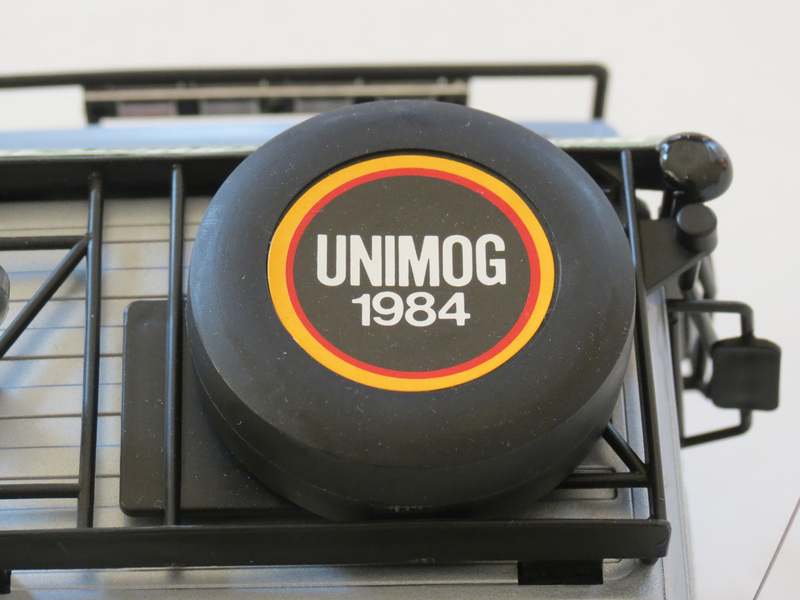 Technotoy later changed their name to Tronico and continued to be the distributor for Nikko products in Europe during the 1980s, and perhaps some of the 1990s as well – however they no longer exist today. How much credit they (and their designers) deserve for this beautiful piece, or whether it was all Nikko’s idea, I have no idea. 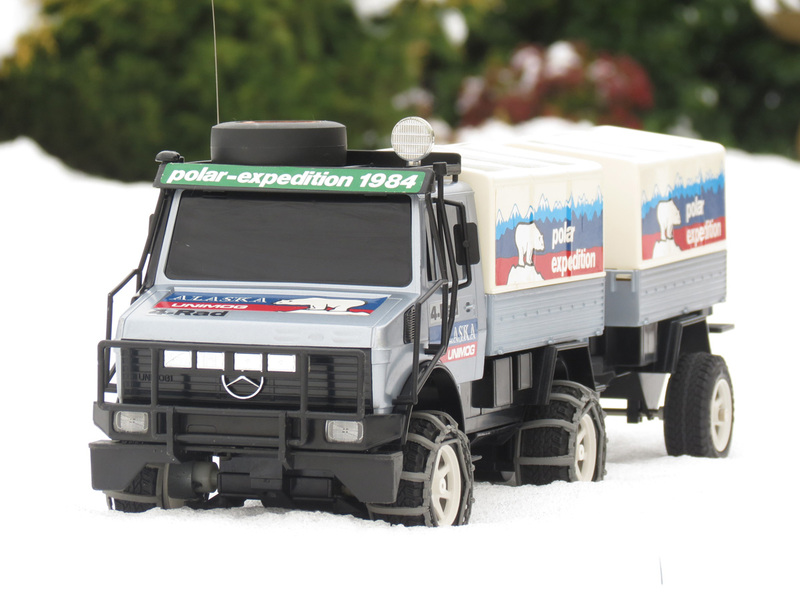 But my guess is that they may have asked Nikko to manufacture special editions of certain R/C models to suit European buyers, and this is perhaps why a cold-climate edition of their already-popular Unimog toy seemed like a smart move for European children. 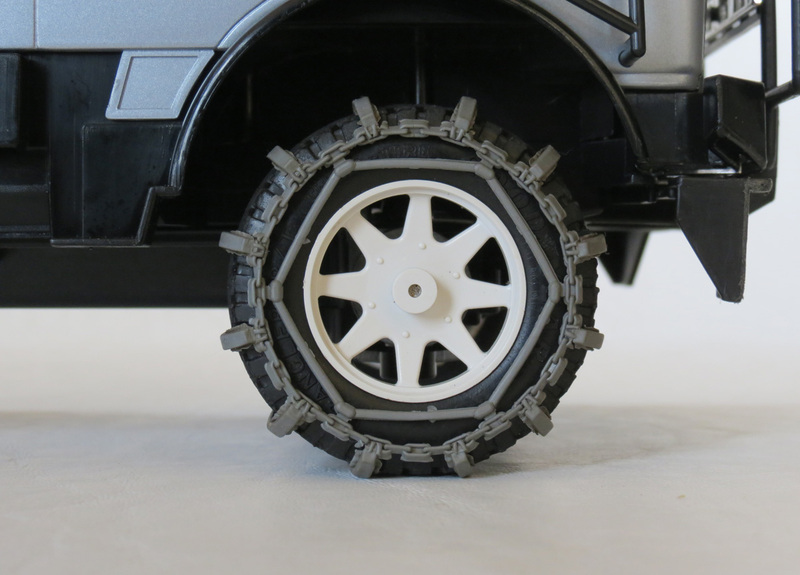 The vehicle comes with four snow chains for the four powered wheels of the Unimog itself, and they are made of rubber and must be fitted carefully by pulling them over each wheel. They fit pretty snugly but are also a little delicate and could break if you’re not careful. Up close, you can clearly see that they depict actual chain linkages, designed to help crush icy surfaces to provide added traction. 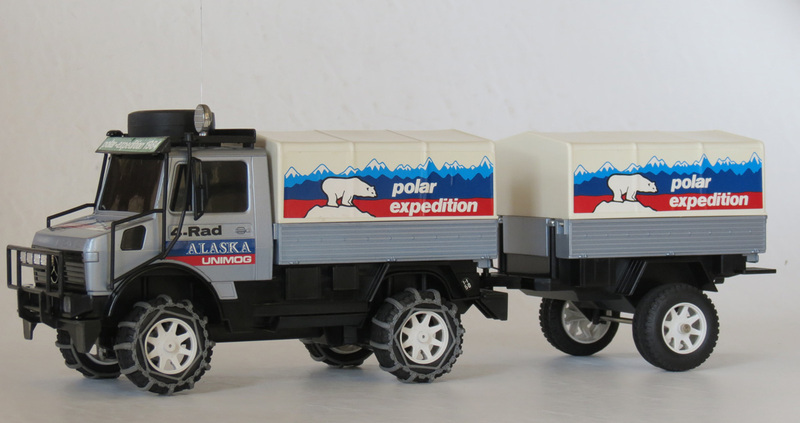 To my knowledge, this is the only R/C toy (certainly among ready-to-run vehicles) ever made, where the manufacturer went to the trouble of adding little toy snow chains. 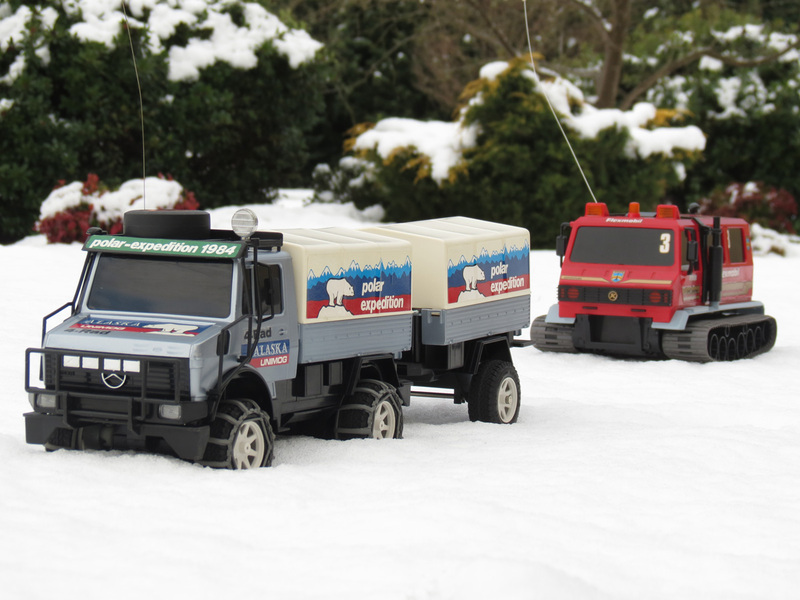 Of course, the question is – do they actually help the vehicle in snow? 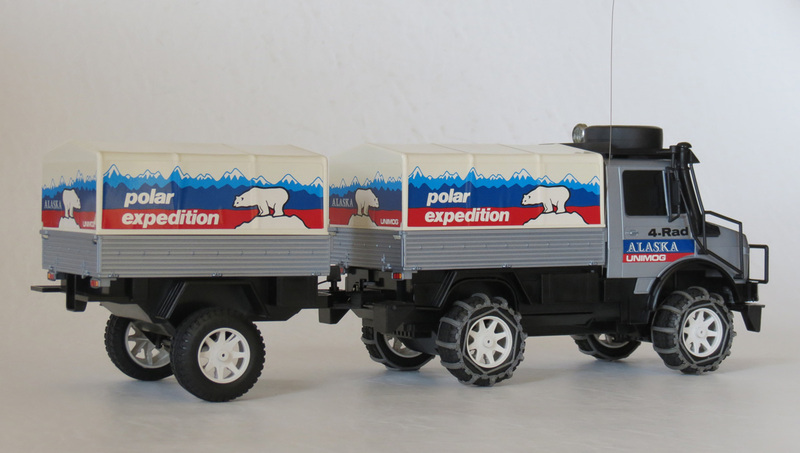 While you might be able to find the Technotoy/Nikko Alaska Polar-Expedition Mercedes Unimog once in a while somewhere in Europe, the vasty majority of examples of this toy left in the world are now incomplete. Just like the Paris-Dakar Unimog, parts of this toy are actually pretty fragile, and there are lots of little pieces you must attach – many of which have simply gone missing over the years, as they fell off when their owners played with them. In fact, I would rate this just about the most difficult R/C model to find in complete condition, that I have ever seen. Right up there with the Gama Sea Ranger with it’s fragile and elaborate chrome pieces, or the Kyosho Volkswagen Baja Bug with it’s impossible to find tyre squeeze pump. Basically, the 1980s were a wonderful era in which a lot of R/C toys came with elaborate and insanely cool little accessories and pieces. But this attention to life-like realism also resulted in most of these little items going missing over the years, making it all very collectible today. To sum up all the little parts included with this vehicle: there are two rear vision mirrors, two sets of side bars, a roof light, rear canopies (often missing OR broken), a trailer latch, and of course the four snow chains. In addition, many of these pieces can break if treated roughly, so it’s not just a case of finding them all – but finding them unbroken. 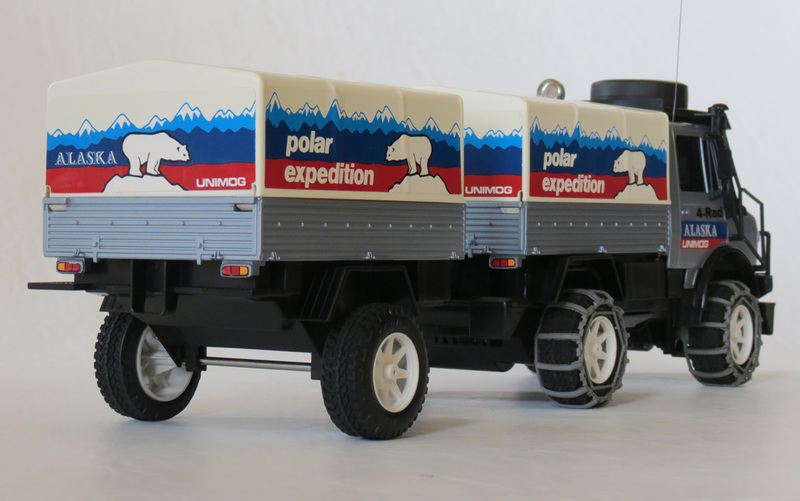 If you’re looking for an R/C toy collecting challenge that will keep you ‘amused’ for years to come, set yourself the task of finding this model in complete condition. If you enjoy punishing yourself, you won’t be disappointed! Performance of this model is identical to that of the Paris-Dakar model, with the vehicle operating with the same batteries, and same direct forward/reverse, left and right (and no digital proportional) behaviour. There are two speeds, constant 4WD, and the front headlights also come on while running – which is very useful when caught in a blizzard. For a more detailed description of the performance, you should also check out my earlier article. The rear trailer is attached via a latch/pin attached to a cable. 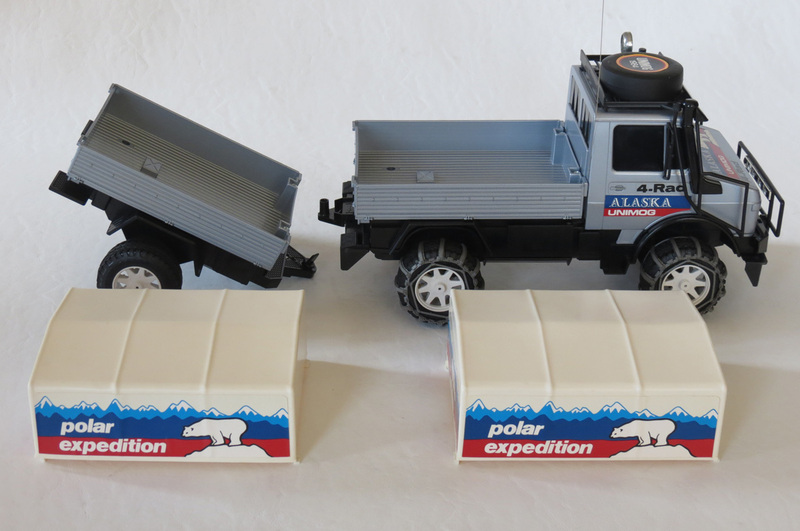 And for anyone who was a relatively careful kid with their toys back in the 80s, the play options would have been expanded with the ability to stow small items inside both the Unimog and the trailer. To cap it all off, Nikko did a really wonderful thing and put decals of the actual year of this toy’s release on the toy itself. To sum up, this model is both one of the most charming of all early-era Nikko R/C models, and certainly one of my favourites. What amazing, creative and realistic toys Nikko made in that period from 1980 – 1985 (before the buggy boom) – sometimes fragile, but always beautiful to behold, and able to really inspire the imagination of any kid lucky enough to own one at the time. 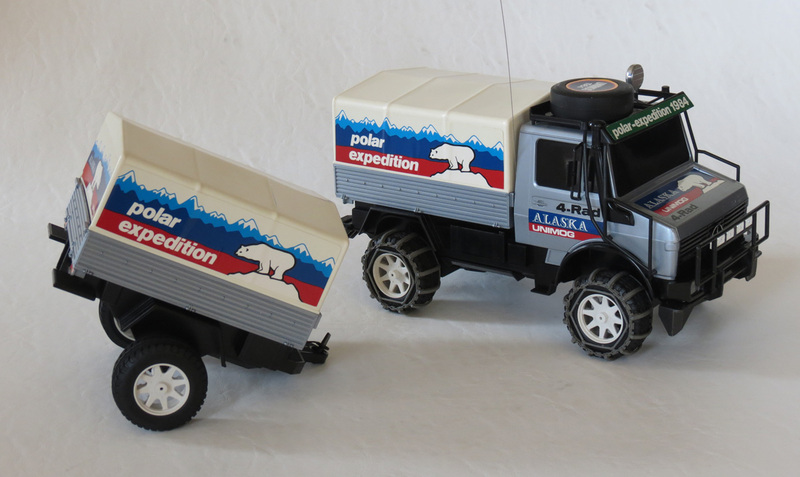 Can you imagine seeing something like this polar Unimog set, on the shelf of a toy shop today? It may have been fragile with all it’s accessories, but the bulk of this vehicle is pretty solid and made from tough plastics. And there’s just something far more inspiring about realistic toys like this, than the cartoonish (and often flimsy) trash of today. Alas, this is one truly impossible R/C toy to find with all the pieces. 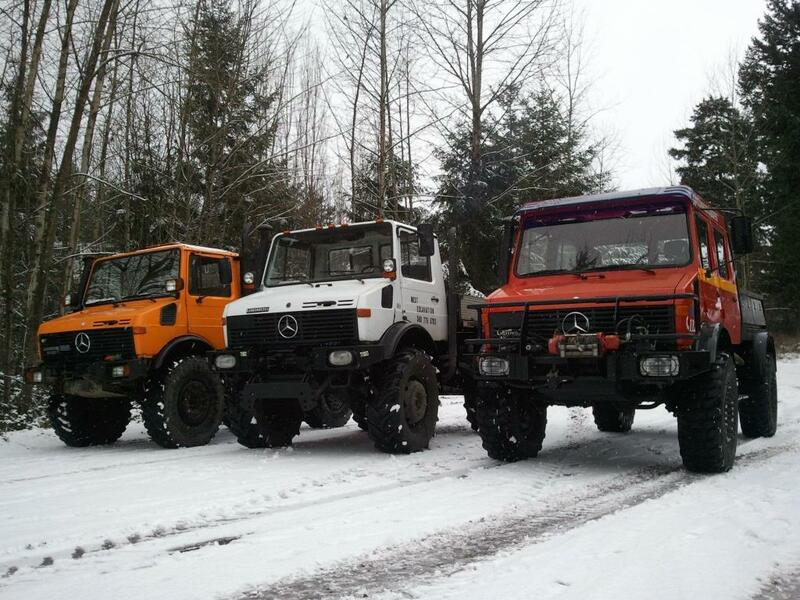 But certainly worth every minute of your long search if you appreciate early Nikko models, and particularly if you’re a Mercedes Unimog fan. 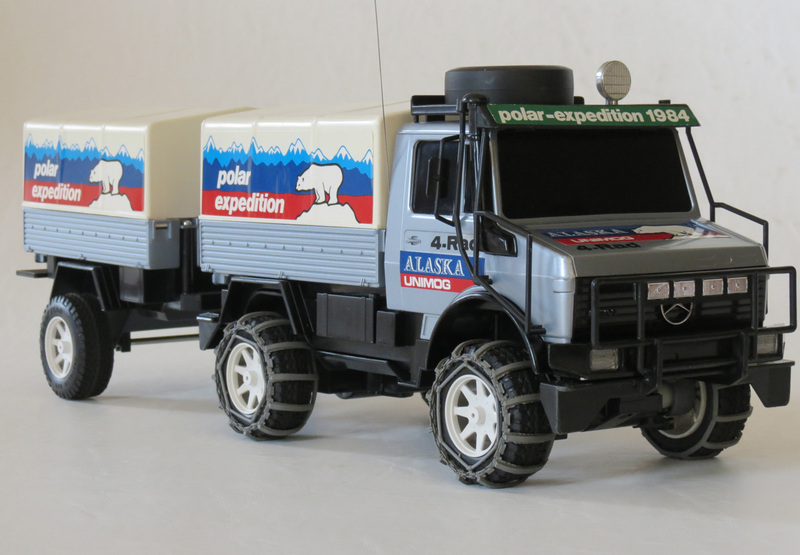 As mentioned, the Technotoy/Nikko Alaska Polar-Expedition Mercedes Unimog is rare, and has a lot of small accessories – some that are fragile. Here are the main things to look out for when collecting this model.